One hundred years ago today, Leo M. Frank was lynched to an oak tree at Marietta — one of the most notorious mob murders in American history. Methodically extracted hours before from the Midgeville State Penitentiary by an Ocean’s Eleven-style team of coordinated professionals, Frank’s murder was as shocking in 1915 as it reads in retrospect. The well-heeled Jewish Yankee was factory superintendent at the National Pencil Company in Atlanta when a 13-year-old girl in his employ was discovered in the factory’s basement — throttled and apparently raped. That was in 1913; for the ensuing two years, the prosecution of Mary Phagan’s boss as her murderer would play out in sensational press coverage. Frank is today widely thought innocent of the crime, although the Georgia Board of Pardons and Paroles has balked at issuing an unconditional pardon since so little of the original evidence survives. (A 1986 pardon came down “without attempting to address the question of guilt or innocence” in recognition of the slanted trial and the failure to protect Frank from lynchers.) But this was much more than a courtroom drama; the Frank affair crackles with the social tensions of early 20th century America. Industry and labor; integration; sexual violation; sectional politics; race and class and power. 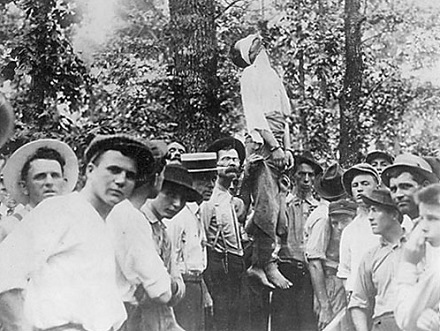 Populist Party politician Thomas E. Watson, whose magazines made a dishonorable intervention by openly agitating for (and then celebrating) Frank’s lynching, captures the Zeitgeist for us as he fulminates against the nationwide campaign to grant the convicted murderer a new trial: “Frank belongs to the Jewish aristocracy, and it was determined by the rich Jews that no aristocrat of their race should die for the death of a working-class Gentile.” Frank came to enjoy (if that’s the right word) the editorial support of most of the country’s major papers, but the meddling of northern publishers, and of fellow Jews in solidarity,* arguably led Georgians to circle wagons in response. Present-day Muslims called upon to disavow every bad act by every other Muslim would surely recognize this no-win position. But then we must also add that Watson himself, a lawyer, had been approached by Frank’s defense team hoping to enlist his bombast to defend their man at trial. The white supremacist demagogue would have been perfect for the job, for the legal battle pitted the credibility of a black janitor named Jim Conley against that of Frank. 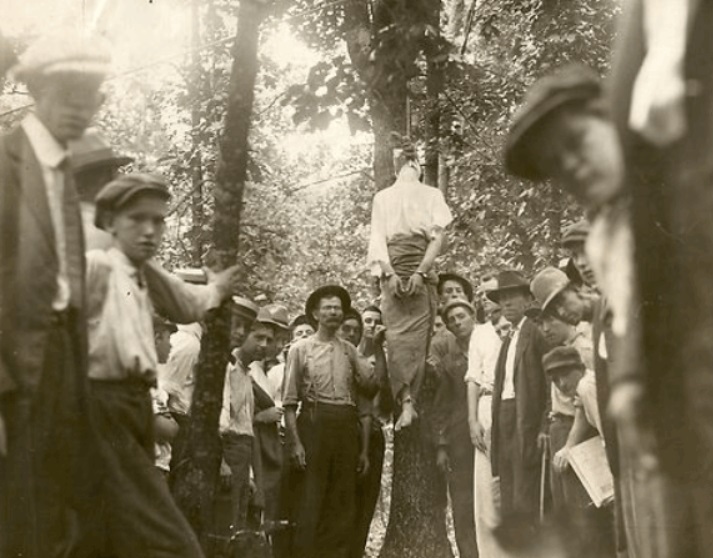 my execution will make the advent of a new era in Georgia, where a good name and stainless honor count for naught against the word of a vile criminal; where the testimony of Southern white women of unimpeachable character is branded as false by the prosecution, disregarded by the jury and the perjured vaporings of a black brute alone accepted as the whole truth. 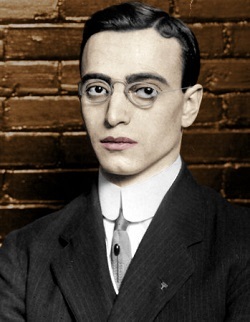 In the end it was a zero-sum game between Jim Conley and Leo Frank: one of them was the murderer; each accused the other. Their respective desperate interests permeated to their respective communities. After Frank’s lynching, hundreds of Jews left Georgia; many who remained took pains to downplay their Jewishness. By whatever circumstance police zeroed on Frank and the white community’s passion followed — tunnel vision that would eventually manifest itself in a circus courtroom atmosphere where the prosecuting attorney was cheered and defense witnesses hooted at and the ultimate outcome more demanded than anticipated. 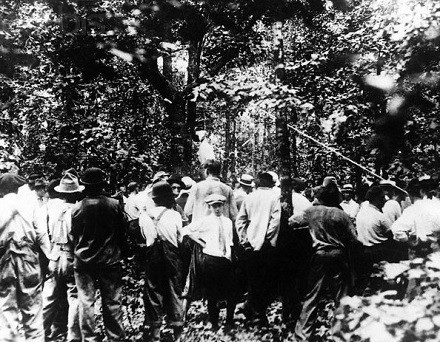 The judge feared that an acquittal would result in the summary lynching of not only Frank but his defenders. Mary Phagan was killed on Confederate Memorial Day, the “holiday” this ballad alludes to. Unusually for the time, appeals on the case reached the U.S. Supreme Court which declined to intervene — although two justices filed a dissent citing the egregious trial atmosphere. lynch law [is] as little valid when practiced by a regularly drawn jury as when administered by one elected by a mob intent on death. But that mob would still have its say. On the eve of Frank’s scheduled June 22, 1915 hanging, outgoing governor John Slaton commuted the sentence. Frank was spirited away to the penitentiary under cover of darkness; it was hoped that the remote and reinforced edifice would deter any reprisal. It turned out that the furies who hunted Franks could not be dissuaded by mere inconvenience: a committee calling itself the Knights of Mary Phagan formed with the open object of organizing the intended mob vengeance — and indeed it was almost superseded in July of that year by a fellow-prisoner who slashed Frank’s throat as he slept. Frank survived that murder attempt only to await the next one. Who knows what fancies frequented him in those weeks when he ducked from the shadow of the gallows to that of the lynching-tree, object of pity or hatred. He had time on the last day to savor his impending fate when the Knights methodically cut their way into the penitentiary — snipping the phone wires and disabling the vehicles — and marched their man out with nary a shot fired. Then, a convoy of automobiles “sped” (at 18 miles per hour) all the way back to a prepared execution-site at Marietta. The drive took seven or eight hours over unpaved country lanes, and for every moment of it Frank surely knew how it would end. * Frank was a chapter president of the Jewish fraternal organization B’nai B’rith; the Anti-Defamation League of B’nai B’rith was founded in 1913 as a direct outgrowth of the Frank campaign. The anti-Semitic feeling was the natural result of the belief that the Jews had banded to free Frank, innocent or guilty. The supposed solidarity of the Jews for Frank, even if he was guilty, caused a Gentile solidarity against him. ** Maurianne Davis’s Strangers and Neighbors: Relations between Blacks and Jews in the United States has a trove of interesting editorial comment from Frank’s contemporaries in the black press, and the Jewish press. 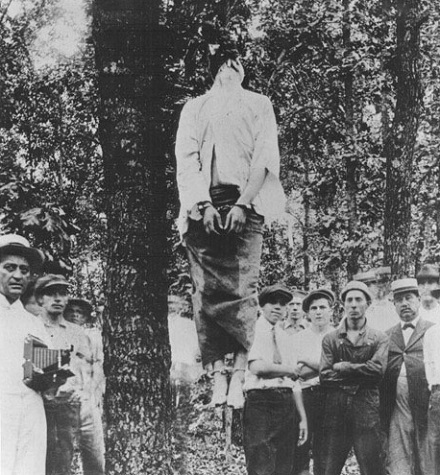 Conley was actually the confessed accessory, and served a year in prison for it: he said that he complied with Frank’s order to hide the body for fear that his “white” boss could easily get Conley lynched for the crime. Conley also wrote (under Frank’s directive, he said) the preposterous “murder notes” found with the body that purported to be Mary Phagan’s dying indictment of Newt Lee, the African-American night watchman. † The allusion to political suicide suggests Slaton’s mind was on the precedent of Illinois Gov. John Altgeld, whose career was destroyed by pardoning some of the Haymarket anarchists. If so, Slaton was quite correct; he actually had to flee Georgia altogether and could not return to the state for more than a decade.